You are currently browsing the category archive for the ‘Vegan MoFo’ category. Hey everyone! Today was the last day of Vegan MoFo. It was a really great experience for me. I discovered so many new blogs that I enjoyed reading so much! Vegan MoFo has kept me moviated to post at leat 5 times a week and I will try to contuine that throughout the year. I hope you all had a great Halloween! Today I wanted to make something fall/ Halloween like, the problem was I didn’t have any fall type vegetables. 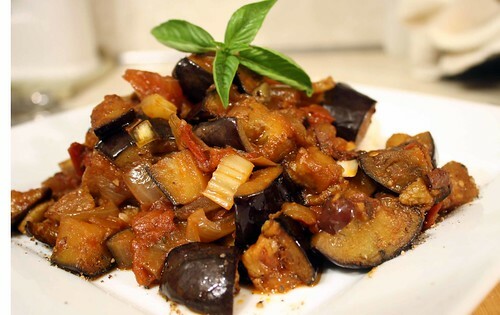 I only had summer ones like eggplant and zucchinii. 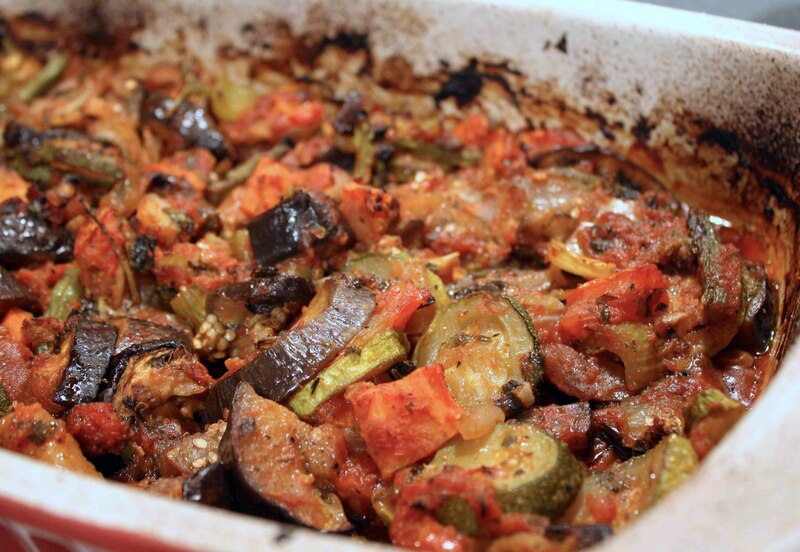 I quickly threw whatever vegetables I had in my fridge into a casserole dish. I flavored the veggies with fresh mint, thyme, and salt and pepper. I also added tomato sauce to the vegtables. I then slow roasted them for a good one and a half hours. The result was awesome tender roasted vegetables. It was really good. Hey everyone! This is my 18th Vegan MoFo post. I don’t think I am going to have 20 post by tomorrow. Oh well. I have been a bit lazy this week in cooking. I just made a tagine and that’s it. I didn’t do much cooking. I promise you next week I will have a lot of interesting things on my blog! Anyways, I did a survey from Jess of Get Sconed. What was the most recent tea you drank? The most recent tea that I drank was camillolle tea. What vegan forms do you post/lurk on? I post on The PPK forums. I think PPK is the best forum ever! 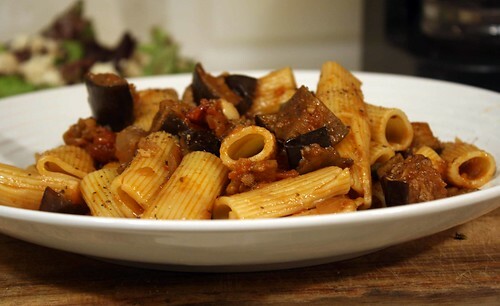 You have to have tofu for dinner, and it has be an Italian dish. What comes to mind first? How many vegan blogs do you read on an average day? I try to read all of my blogroll at least 3 times a week. Besides your own, what is the most recent one you’ve read? I just read Let’s Get Sconed which is an awesome blog! If you could hang out with a vegan blogger that you haven’t met, who would it be, and what would you do? I want to meet Isa! She has taught me so much about cooking through her books. She’s the best! If you had to base your dinners for a week around one of the holy trilogy – tofu, seitan or tempeh, which would it be? I love tofu! So many things you can do with it. If you had to use one in a fight, which would it be? Name 3 meals you’d realistically make with that tough protein of choice! 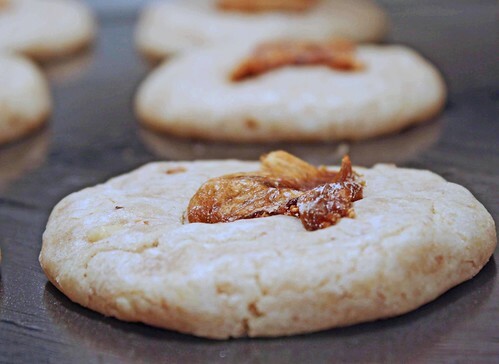 What’s a recipe in vegan blogland that you’ve been eyeing? 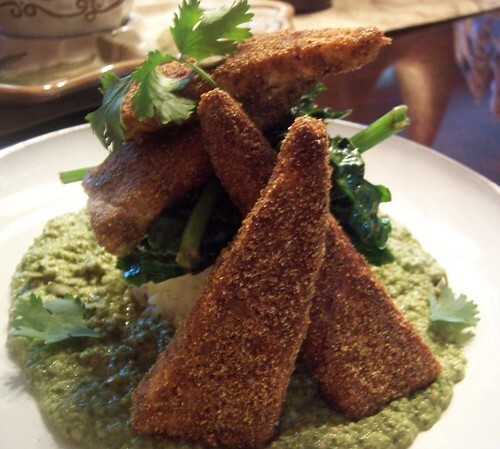 i really want to make Vegan YumYum’s fried seitan salad! Do you own any clothing with vegan messages/brands on them? No, But one day I will make it there! What age did you first go vegan? Did it stick? I became vegan just one year ago when I was 15. I was vegetarian five months before I became vegan. 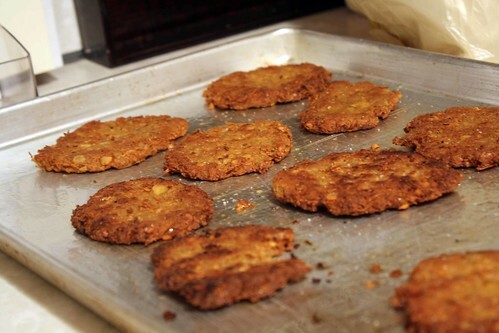 What is the worst vegan meal you’ve had? Who cooked it? I made a nasty eggplant moussaka which was from a betty crocker cookbook. It was really bad. I was inspired by all the awesome vegan blogs out there. I wanted a place where I can record my vegan eats! What are three of your favorite meals to make? 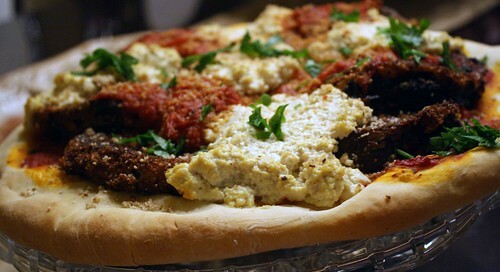 What dish would you bring to a vegan Thanksgiving-themed potluck? I would bring an apple pie or pecan crusted seitan. 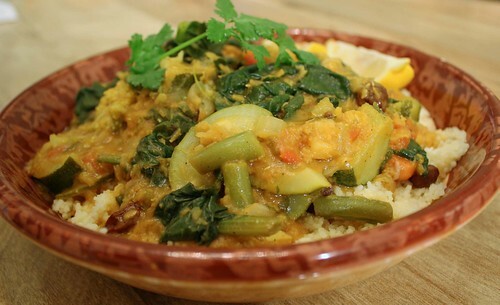 Where is your favorite vegan meal at a restaurant? How many times have you ordered it? I only been to a vegan restaurant once but I forget what it was called. I ordered tofu which was really good. 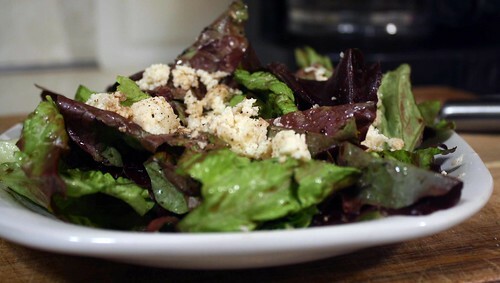 What do you think the best chain to dine as a vegan is? I like Moe’s, it’s like a burrito place, so good! They have tofu there too! This vegetable is not allowed in my kitchen…..! Well I have been very lazy the past few days. 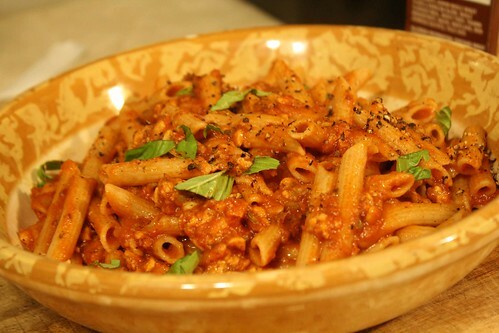 I think I am just going to have some pasta with jarred garden tomato sauce. Hey everyone! 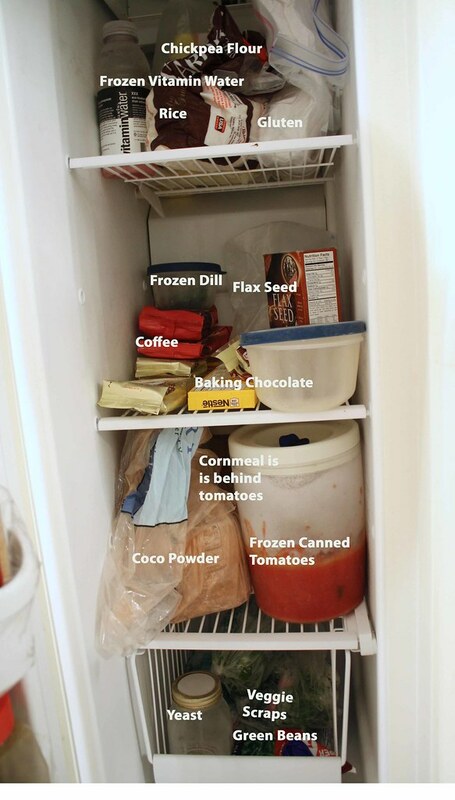 Kelly from The Pink Apron tagged me for seeing what’s in my freezer. Thanks Kelly for tagging me! 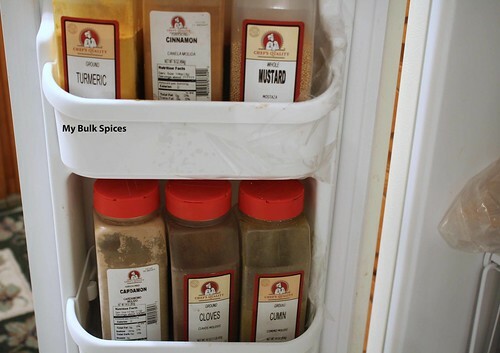 I use my freezer as a storage center for some of my spices so they don’t go bad as I bought them in bulk. My freezer doesn’t have meat and it rarely has meat since my family doesn’t eat a lot of meat since I became vegan. I’m glad because I am saving so many animal! Also today I made some pasta with what ever vegetables were in my fridge. I have been going on a pasta overload but its OK, because they are so good! 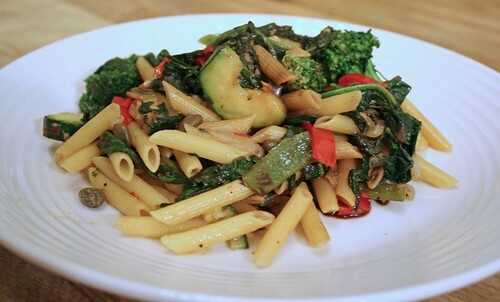 Today I had penne with capers, zucchini, spinach, shallots, broccoli, balsamic vinegar, and garlic! It was so good and simple! Hey everyone! Today for dinner I made Albanian-Style Bean. You may be wondering what in the world are Albanian-Style Beans, don’t worry I am here to tell you. I am here to introduce a great way to eat beans!! My ethic backround is Albanian. My mom and dad were born in Montenegro so I know a lot of Albanian dishes that I will be sharing with you from time to time. By the way there are Albanian people in Montenegro. 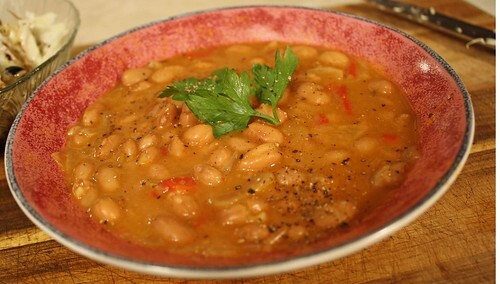 Whrn I went to Montenegro I told everyone all the different ways I cook beans like put them into soups, stews, etc. This was unheard of there. There is only one way Albanian people eat beans. They eat them in a gravy like liquid. The liquid is like a thick soup. The most popular beans that we use are any white bean and roman/kidney beans. These beans can be flavored in so many ways. I like to put whatever soup vegetables I have on hand. Most often I put carrot, peppers, and celery. I like to flavor it with paprika, oregano, and Vegeta. Now you may be wondering what in the world is Vegeta. Vegetais an awesome seasoning that Albanians always use, in fact it’s our number one seasoning. 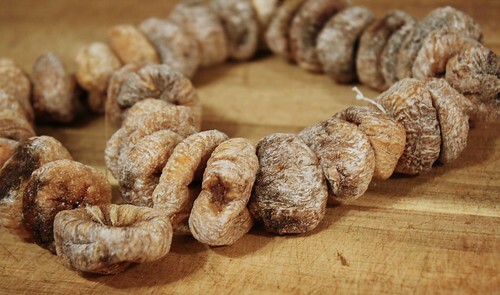 It is dehydrated vegetables, some spices, and lots of salt! Its really good and I put it in quite a few dishes mostly Albanian dishes. I feel it is difficult make Albanian food without vegeta, it just doesn’t taste Albanian. I think almost every Albanian household has vegeta. I really think you should go to an eastern European market and get it. I sometimes use it in place of vegetable bouillon cubes or vegetable broth. 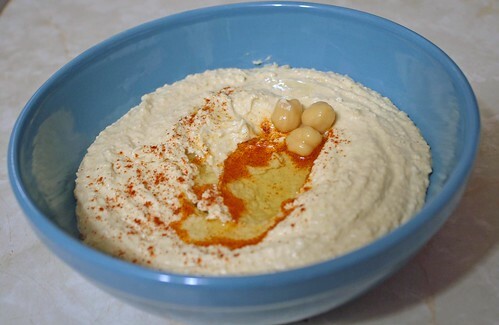 I am going to give you a basic recipe on how to make these beans. I am always experimenting on these beans as I just learned how to make them. This is what I did with them today. Soak the beans for 8-12 hours. Rinse them and put about 6 cups of water covering them by a fair amount. Add the carrots and half an onion. Bring to boil and then to a simmer. Cook beans until they start to get tender about 40 mins depending on beans. When they start to get tender start chopping the onions. Heat a skillet to medium heat. Add the oil. Add the onions. You want the onions to cook nice and slowly for about 10 minutes. Add the herbs and paprika. Also add tomato paste if using. Also season with salt and pepper. Add the flour and cook for about a minute. Add the mixture to the beans. Then you want to clean the pan with the bean broth and add it back to the beans. Cook the beans for 15 minutes until thickened. You want it to be nice and gravy like. Season with salt and pepper. 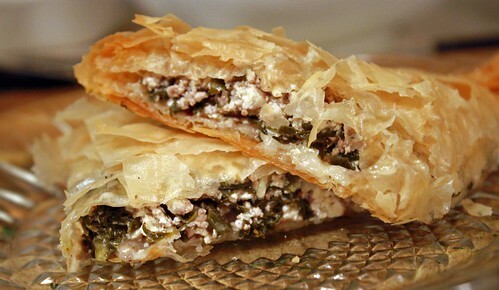 If you have any questions please feel free to ask me as you probably have never heard of Albanian food or this dish. Hey everyone! My mom bought quite a few vegetables this week. They all screamed Soup to me all week long so that’s what I made today! I love making making soup. 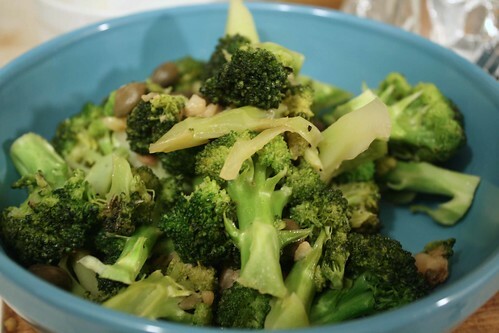 I think what I love most is chopping all the vegetables, I think this is like the best part and eating it too. Today I made a Minestrone soup which is a soup with beans, pasta, and vegetables. I made a lot, by a lot I mean a pot overflowing with soup. I will have leftovers for a while. I love eating soup the more it sits, it just gets better and better. 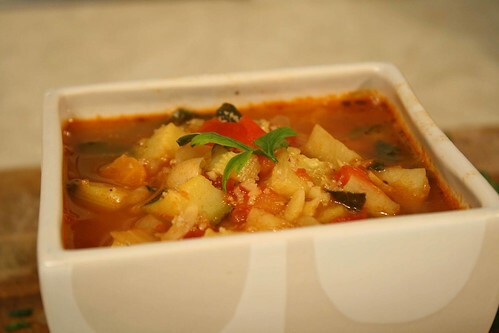 Minestrone Soup is one of best soups and it is so simple to make, I throw whatever vegetables I have on hand, some beans, some pasta, broth, tomatoes, herbs, and that’s about it. It’s that easy. 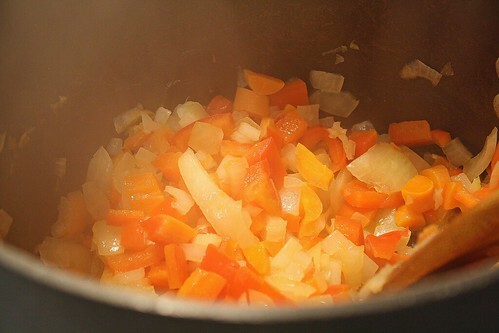 My mom has taught me everything I need to know about making a vegetable soup, that I can make it with my eyes closed! I wrote a recipe that describes what I do most often when I make this soup. I use whatever vegetables I have on hand. Some of my key vegetables to include are cabbage, carrots, onions, celery, bell peppers, zucchini, potatoes, tomatoes canned or fresh, and spinach. Feel free to add whatever you like. I add the vegetables that take longer to cook like potatoes, cabbage, carrots in the beginning and vegetables that take a shorter time to cook like zucchini in the end. 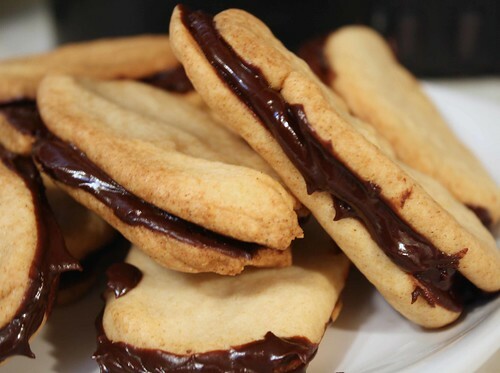 This is a very verstile recipe, you could play around with it! 1/2 cups short tubed pasta like elbow, I used orzo this time because it was all I had. 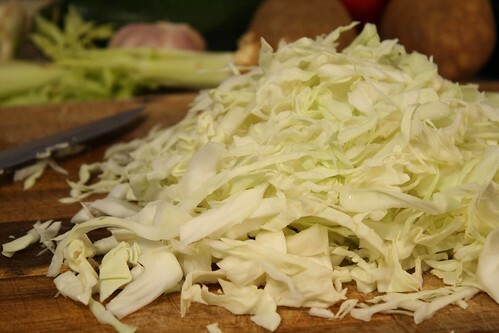 First you shred the cabbage, I shred it with a knife because the cabbage shreds better than in the food procceser. Chop the onions, carrots, and celery. Heat a soup pot with oil to medium heat. 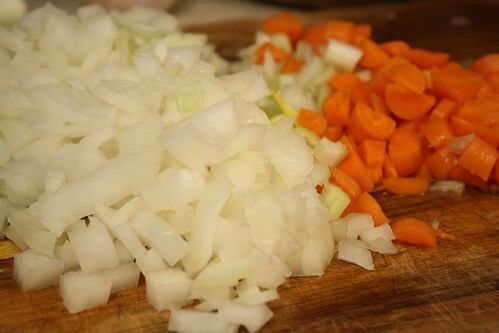 Add the onions, carrots, and celery and saute for 8-10 minutes. Meanwhile start chopping the rest of the vegetables. Add the bell peppers. Add the tomatoes and cook for 5 more minutes. Add the potatoes and cabbage. Also add the bay leave, oregano, thyme, salt/pepper and sage. Now you can add the broth and bring it to a boil. When it’s up to a boil bring it to simmer. Simmer it for 15 minutes. 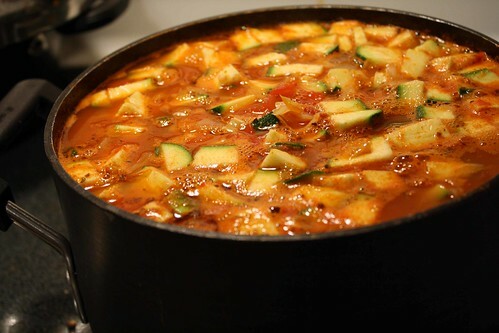 Add the zucchini and cook for another 10-15 minutes. Add the pasta and cook for another 10 minutes. Now add the spinach and beans. Cook for 5 minutes. Finish it off with the fresh parsley. Enjoy!